Today’s post is sponsored by Le Creuset! As always, all thoughts and opinions are my own. Be sure to scroll to the bottom of the post to enter for the chance to win your own Le Creuset Signature Skillet! 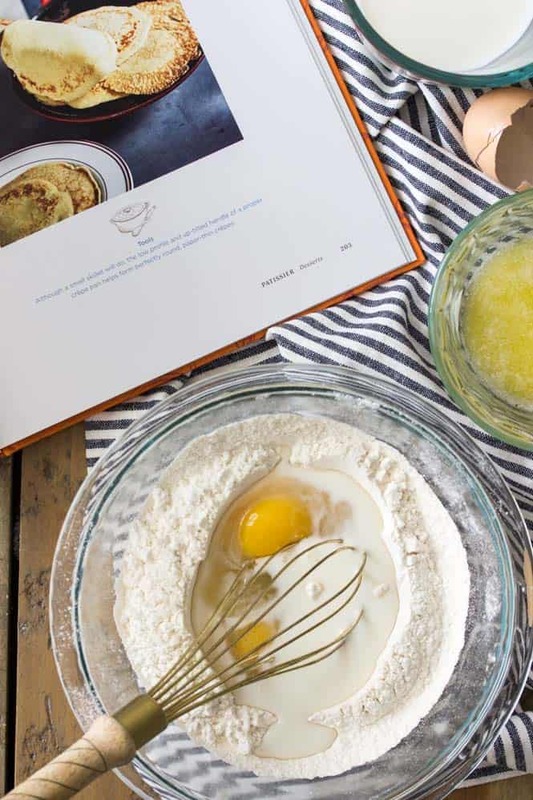 Today I’m sharing a classic crepe recipe, straight from the pages of the new Le Creuset Cookbook! 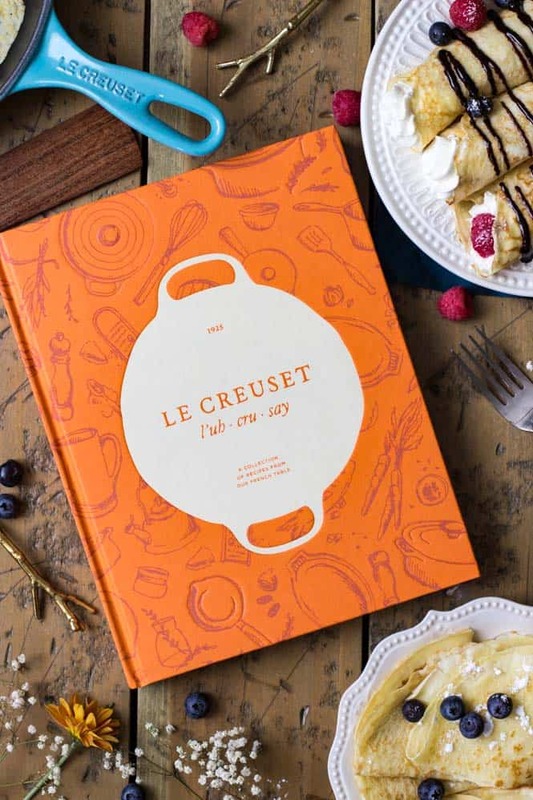 When Le Creuset asked me if I would be willing to share a recipe from their new cookbook, the toughest decision for me was which recipe to choose! While they have a ton of great savory recipes (there’s an amazing authentic French Onion Soup recipe! ), I knew that I wanted to share something from their hefty Patissier chapter. The chocolate souffle was tempting (and a bit intimidating), but ultimately I decided on this classic crepes recipe, and I think you are going to love it. I was actually a little surprised I hadn’t already shared a recipe for crepes on my blog, since these are such a classic breakfast staple! Even if you haven’t made crepes before, I’m sure you’ve heard of them. 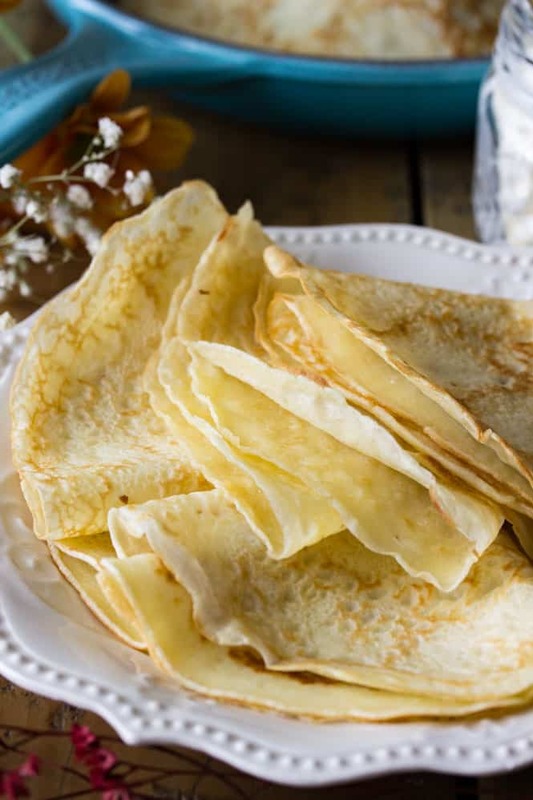 They’re the French cousin of the pancake, known for their paper-thin texture and versatility when enjoying (both sweet and savory fillings are at home in crepes). Warm a skillet and cook a small amount of batter, flip, and serve. The cookbook goes into plenty of detail (and of course I share the full actual recipe below) on how to make sure your crepes don’t tear while cooking and the best technique for combining the ingredients without under- or over-mixing. And the cookbook is just is gorgeous, guys. It’s sturdy (seems like a silly thing to say, but it’s important in my kitchen that my cookbooks are well-made and can stand up to lots of use and page-flipping), brightly colored, and it includes over 80 classic French recipes. It’s full of beautiful full-page photos and includes lots of helpful tips and notes on the tools and techniques that will help you have the best results when making these crepes, and for every other recipe in the book. 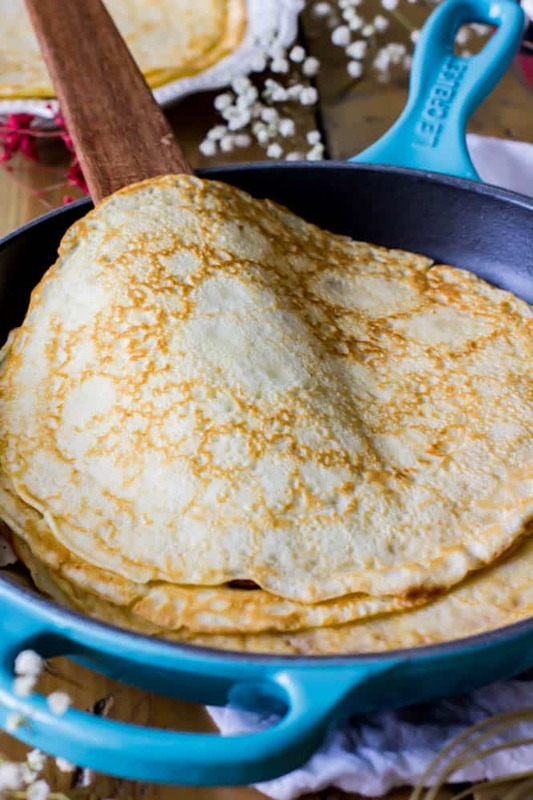 I used my Le Creuset signature skillet to make these crepes (and if you enter the giveaway below you can win your own! ), but it definitely took a bit of practice using a cast iron pan to keep the crepes from sticking. It can certainly be done in a cast iron pan, but f you’re struggling, it’s much easier to start with a nonstick skillet or even a specially made crepe pan (currently on my wish list!). Fortunately, this crepe recipe makes enough batter that even if your first few crepes don’t come out perfectly, you have plenty more chances to get it right. 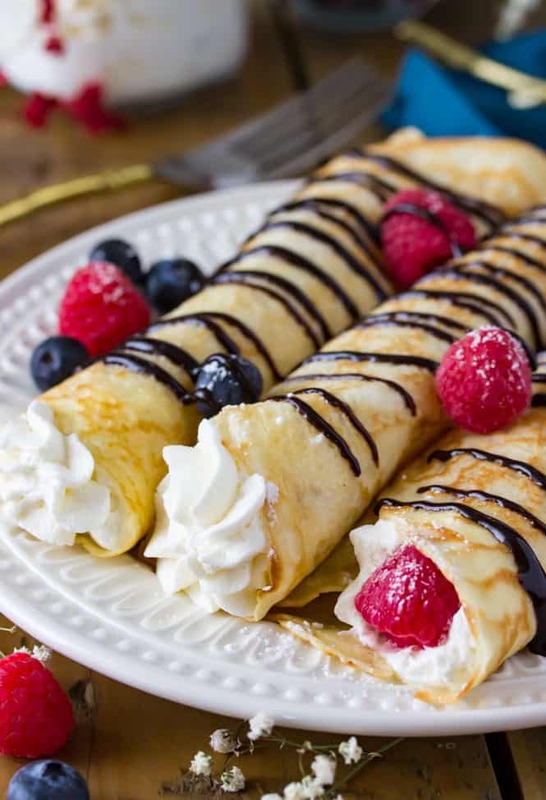 They taste great served warm, dusted with powdered sugar or rolled around a whipped cream filling, served with fresh fruit, or drizzled with chocolate. I definitely also ate a few crepes plain, hot off the skillet. Alright, now for the giveaway! I am very pleased to have partnered with Le Creuset to bring this easy crepe recipe to you today! They have kindly agreed to give away a 9″ signature skillet to one lucky winner! You must be on my e-mail list to win. If you’re already a subscriber — great, on to the next step! If you’re not, you can sign up here. Leave a comment below telling me what color cast iron you would want! You can check out the color options by going here — there are so many great ones! Make sure that you use a valid email address when you enter (don’t worry, it won’t show up on the page, only I will be able to see it) so that I can contact you if you win! We can only ship US so you must also be a US resident in order to win. One winner will be chosen at random, and I am accepting entries through November 19th! THE GIVEAWAY IS NOW CLOSED. CONGRATULATIONS TO AMY C. WHO IS THE WINNER OF A BRAND NEW LE CREUSET SKILLET! 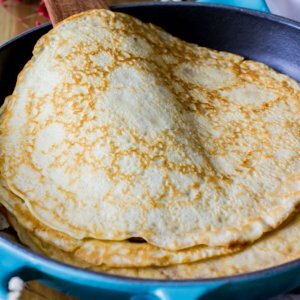 A classic Crepes recipe, courtesy of Le Creuset! 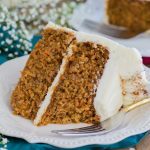 This recipe was reprinted with permission from Le Creuset and was originally published in the Le Creuset Cookbook. 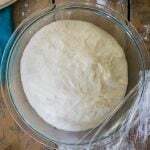 Sift flour and salt into a large bowl. 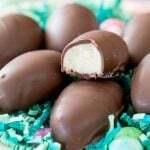 Make a well in the center, add the eggs and 1/2 cup of the milk. Whisk until smooth. Whisk in the remaining 1/2 cup of milk and the butter. cover and refrigerate for 1 hour to allow the bubbles in the batter to escape (This makes the crepes less likely to tear during cooking). Warm a crepe pan or small nonstick skillet over medium heat and lightly brush it with oil. 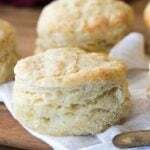 Lift the pan from the heat, ladle on a scant 1/4 cup cup of the batter, and gently swirl and tilt the pan so that the batter forms an 8-inch round. Return the pan to the heat and cook until the top of the crepe looks dry and the edges are set, about 45 seconds. Loosen the crepe with a spatula and flip it. Cook the other side until the crepe is pale golden brown, about 30 seconds. Slide the crepe onto a plate. Repeat with the remaining batter, brushing the pan with more oil as needed. If serving the freshly cooked crepes while still warm, it's okay to stack them. 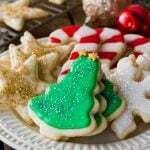 Otherwise, lay them out in a single layer to prevent sticking as they cool. You can stack and store the cooled crepes in a zip-top freezer bag in the refrigerator for up to 2 months. Thaw crepes before trying to peel them apart. 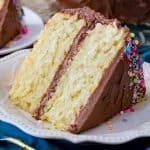 I absolutely love your recipes. I am a great fan of Monte Cristina Crepes. They are Awesome. Thank you so much for sharing! 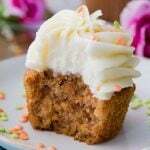 I was wondering if uou could make the batter and let it set overnight in the fridge? Hi Sam, I love all your recipes, but I have a big problem! 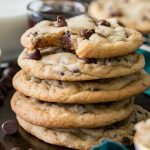 I am not computer savvy , and I don’t know how to pin recipes! I have to save them on the emails, and I am ending up with a bunch of emails! I missed your crepe recipe but when I went on your pancake recipe I saw in blue highliting you posted a crepe recipe before. 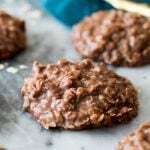 I clicked on it and want to try them but I wish I wouldn’t lose it when I click off that recipe! 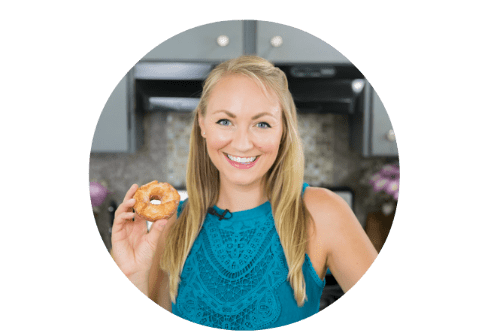 Do u have a cookbook with the recipes you have posted so far? I would love the Amethyst. I’ve pinned a lot of crepe recipes, now I just need the courage to try it. I think the skillet would give me that courage. I would love to have the pretty Caribbean color skillet !!! Marseille would be an excellent addition to my pan collection. This crepe recipe brought back memories of a summer in France. Thanks for jogging those ancient culinary synapses! Oh, the blues ae so beautiful! It would have to be marine blue or marsaille for me! And these crepes are TO DIE FOR! 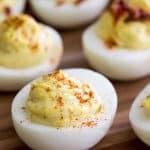 Nothing would make this mama happier than cooking these up!